Enjoy talking on the phone again! 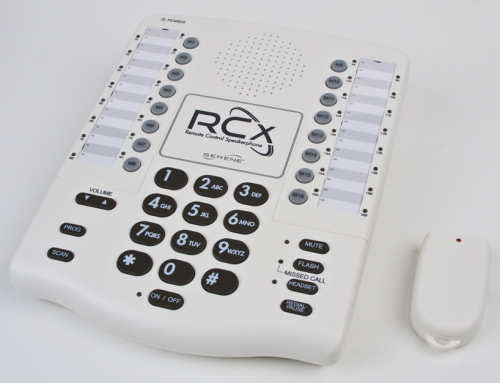 The RCx1000 Remote Control Speakerphone was thoughtfully designed for low mobility users. 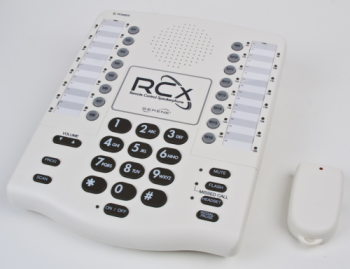 Answer calls with ease with "voice activated - no tough" answering or use the included wireless remote control. 32 "one-touch" scannablel memory dials connect you quickly to your most frequently called numbers. It is easily customizable with accessories to meet specific needs/preferences. Wireless remote with AC adapter is included. Large 3" speaker ensure "best in class" sound clarity & quality. Voice activated answering allows "no touch" anwering for incoming calls. 32 "one-touchable", scannable memory buttons for easy dialing of most frequently called numbers. Wireless Remote with with AC Adapter power & battery backup for 24/7 uninterrupted service. Designed for use with headset/external microphones. Wall Mountable for Optimal visibility. Mute, Flash, Redial, Pause, Scan, Program buttons. On / Off Button / Indicator. Six (6) AA NiMH rechargeable batteries presinstall in speakerphone. SKU: RC2001 - RC-PS PILLOW SWITCH - Control the functions of the RCx-1000 by gently pressing this switch with head, arm, leg, shoulder or other body part. SKU: RC2002 - RC-AS AIR SWTICH - Controls the functions of the RCX-1000 by blowing gently into the sensor. Attaches to the rear of the RCx-1000 or to the remote control. SKU: RC2003 - RC-LM LAPEL MICROPHONE - This highly sensitive microphone can be clipped to the collar. Ideal for users with soft or weak voices. SKU: RC2004 - RC-LS LEAF SWITCH - Activates the RCx-1000 by flicking the flexible lever of this accessory switch. SKU: RC2005 - RC-LO LOLLY SWITCH - Control the RCx-1000 by applying a slight pressure to this switch’s touch plate. SKU: RC2006 - RC-TS TREAD SWITCH - Use this pedal type switch to activate the RCx-1000. * Note: RCX-1000 accessories are Special Order. Prices listed are with RCX-1000 purchase. Available individually at increased price. Call or email us. Note: Accessories for this phone are only available when ordering this phone, and take 3 - 4 weeks.